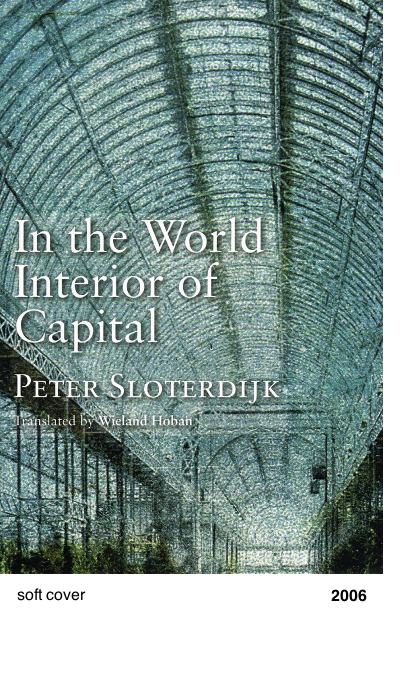 Displaying the distinctive combination of narration and philosophy for which he is well known, this new book by Peter Sloterdijk develops a radically new account of globalization at the beginning of the twenty-first century. The author takes seriously the historical and philosophical consequences of the notion of the earth as a globe, arriving at the thesis that what is praised or decried as globalization is actually the end phase in a process that began with the first circumnavigation of the earth Ð and that one can already discern elements of a new era beyond globalization. In the end phase of globalization, the world system completed its development and, as a capitalist system, came to determine all conditions of life. Sloterdijk takes the Crystal Palace in London, the site of the first world exhibition in 1851, as the most expressive metaphor for this situation. The palace demonstrates the inevitable exclusivity of globalization as the construction of a comfort structure Ð that is, the establishment and expansion of a world interior whose boundaries are invisible, yet virtually insurmountable from without, and which is inhabited by one and a half billion winners of globalization; three times this number are left standing outside the door.